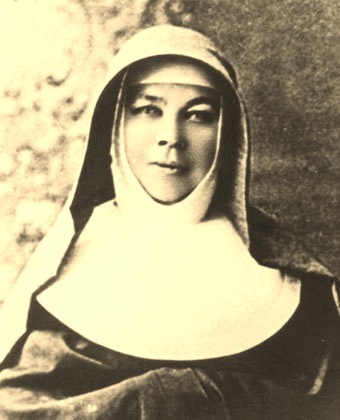 In my first post on Mary MacKillop I concentrated mainly on some salient aspects of her Birth Chart. In this post I would like to explore the major Transits and Progressions that constellated her life. They make, I feel, an interesting astrological tale. 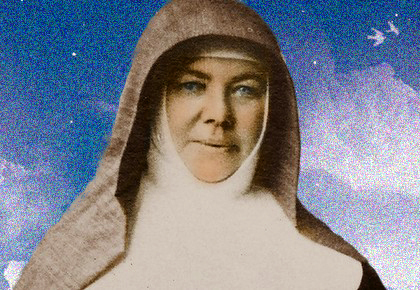 A fascinating example of synchronicity is occurring now, as Mary MacKillop becomes again a household name in Australia, after the confirmation that she will become a Saint sometimes this year. Tomorrow New Moon will be also an Annular Eclipse of the Sun, with a major alignment of Planets in Capricorn. This Eclipse is eerily similar to the one that occurred just prior Mary’s birth in 1842, with the major Capricorn alignment that was reflected in her Birth Chart. Notice in the two Horoscopes the same zodiacal positions of Neptune and Jupiter. The Charts are cast for Wollumbin, the northern New South Wales region where I live. What it is of interest here is just the similarity and near identity between these two otherwise unrelated phenomena. To read more about the Eclipse preceding Mary’s birth see my previous post on The First Australian Saint. And for a description of this present eclipse see my related post, here. To make the similarities between these two separate events more obvious here are the pictures of the two Eclipses, on the left the 1842 one, on the right the one of January 15 2010. She has returned in our collective consciousness through this powerful Eclipse, endowed with the same psychic energy she carried with her throughout her eventful life. Sometimes being fascinated by a mystery like this synchronicity is enough, without the need to ‘explain’ it, one way or the other. A lot of Astrology is like that for me. The mystery is more convincing and feel more right than any clever theory on the subject. Mary Ellen was born in 1842, just 50 years after Australia became colonized by white settlers. Hers was the life of a pioneer and a missionary, a truly romantic heroine. Those were the times surrounding the ‘discovery’ of Neptune (23 September 1846, while the planet was transiting the end of Aquarius, the same position Neptune is now). This was a highly idealistic period, when many mystical branches of learning and the spiritual and occult revival known as romanticism flourished. These were times when also socialistic political movements were born and ideologies that had the welfare of humanity at heart (Marx’s Communist Manifesto was published February 21, 1848). Mary Ellen was but a child when the Gold Rush spread like wild fire in Victoria bringing with it the seeds of many social and moral problems for this early Australian community, the native inhabitants as well as the white colonists, bankruptcy, alcoholism, violence and broken families. Mary’s life literally began with Saturn, Lord of karma and hardship, moving during her first two years over her many Planets in Capricorn. We shouldn’t forget that Saturn was a sort of super-ruler in Mary’s Birth Chart, having sway over all her Planets and Sun in Capricorn, the appointed Sign of Saturn. Furthermore Saturn was conjunct Jupiter at her birth, so that success and fulfilment of potentials (Jupiter’s stuff) could come to her only via the trials that are Saturn’s personal signatures. Mary was born with Saturn behind the Sun in longitude (rising before the Sun). The First pass of Saturn over her Venus (March 2, 1842) coincided with her Christian Baptism on February 28 1942, around 6 weeks of age, a very poignant synchronicity, indicating a symbolical initiation into a life of austerity and chastity, a solitary path (Saturn) yet filled with love and positive feminine energy (Venus). Saturn then became retrograde and moved again over her Venus in June and then November 1842, to make a deeper and longer lasting impression on the baby’s psyche. Love, the maiden Venus, is here hand in hand with Old Man Saturn, the ancient Ripper, Lord of Time and Old Age. Love is serious stuff here, far from superficial, very grounded, responsible and steady. This position also shows her leadership ability, as well as her exceptional practical skills. At another level early disappointment in love are sometimes the expressions of this profound but somewhat melancholic conjunction. 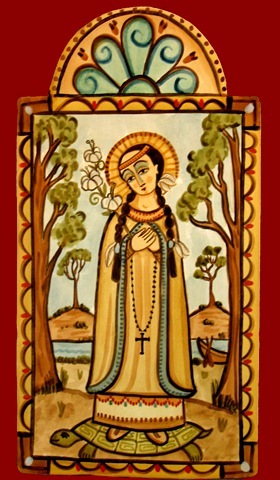 The need for father’s love and approval will constellate Mary’s life, via her encounters with pivotal male figures, mentors and gurus (such as Father Geoghegan and Father Julian Tenison Woods), as well as stern authority figures who played a major role in the shaping of her destiny (bishop Sheil who excommunicated her, and others, positive as well as negative figures in the Catholic Church). After visiting Venus in 1842 Saturn proceeded to move over Mary’s Mercury (February 1843) and Sun (March 1843) and returned in retrogradation over them for the duration of 1843, finishing off with a conjunction to her North Node, the end of her Axis of Destiny that points to the future. All these Saturn’s hits represent a rather ‘hard’ start, often manifesting as lack of security, fears, limitations of all kinds, poverty, sometimes even lack of proper nurture. Beginning with life itself this early transit gave her existence its tone and colour. Her biographers say that her father became bankrupt when Mary was just a baby, when the family home was sold and a life of serious financial difficulties and reliance on the goodwill of relatives and friends began. Being the eldest of eight children Mary had to grow up before her time and sorely missed her childhood, a well documented Capricorn’s effect. While the family may have been very poor, however, it was one for which culture, learning and spiritual practice were important. Mary’s father, Julian MacKillop, as ineffectual as he was as a farmer or politician, provided a sound home education to all his children, in particular Mary who was an intellectually gifted and high-spirited child. Two of her siblings, Alexandrina and Donald, also later embraced the religious and missionary life. The first important life-change I have found in her biography occurred between 1856 and 1858, age 14-16, when Mary began to earn her living and support her family, by working as a governess, a clerk and a teacher. Of course 14 is the age for one of the most important stage of Saturn’s life cycle, when this planet reaches the opposition to its own birth position. In Mary’s case however Saturn not only opposed itself during this time, but also all her Capricorn Planets and Sun. Mary’ Progressed Horoscope is also very interesting to describe this time in her life. 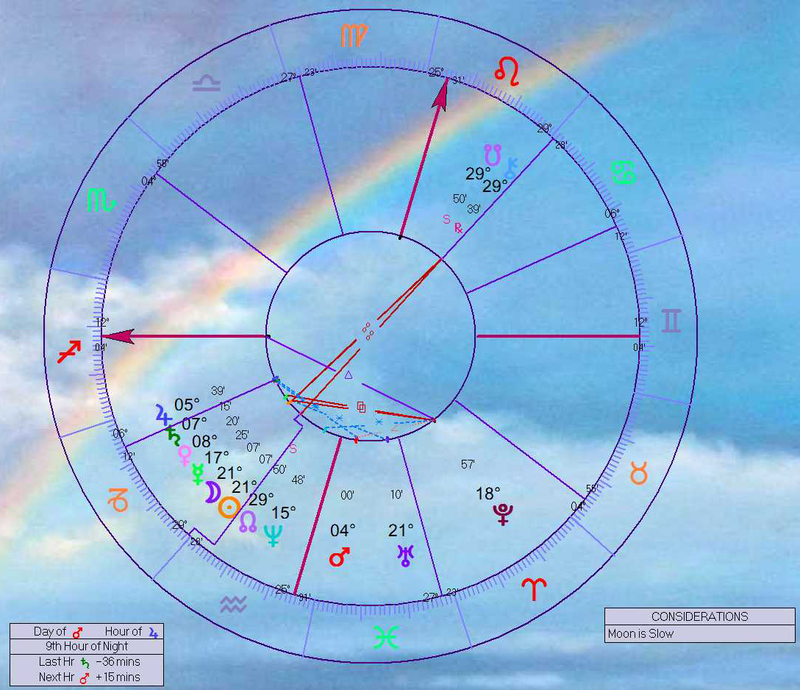 Here is Mary’s 1858 Progressed Horoscope, plotted around her Birth Chart. The slow-moving Planets have hardly moved in 16 years, while the Moon had progressed all the way from the cusp Aquarius-Pisces to Libra. This is a socially active Sign, fitting well her adolescent spirit and the need for her to go out to meet the world. During the year the Moon also formed a 90 degrees angle to her natal Jupiter and Saturn’s conjunction, at the same time becoming conjunct to her Birth Chart’s Mid Heaven, the highest point, symbolical of career and the outer, most obvious expression of the life force. The square to Jupiter-Saturn indicates a mixture of excitement and fears, also a lot of demanding work, hardly remunerated (Jupiter and Saturn are in the Twelfth House of sacrifice and self-undoing). Saturn, also very prominent in Transit, was enhancing the intensity of this progressed aspect. The Moon on the most elevated Angle represents a turn in the wheel of life, in particular the beginning of a new domestic situation. Often a change of residence accompanies the passage of the progressed Moon through one of the four Angles, as it did in Mary MacKillop’s case. Few months earlier, in 1857, the progressed Mercury formed a conjunction to Neptune and sextile to Pluto in the Fourth House, signifying a contact with deeper realities and spiritual ideals, and a necessary separation from family, one with unforeseen consequences, evoking the end of childhood and innocence. These progressions remained active for a couple of years, until 1859, and helped to change Mary’s way of thinking and outlook on life. In 1858 on the Transits’ front, Saturn in Cancer presided over the entire Horoscope, having reached the all important opposition to Mary’s Sun in Capricorn, while entering her Seventh Solar House, the relationships area. This a typical growing up transit, when the person gains a new sense of self through work and added responsibilities. Life and one’s own self perception became more serious and one needs to accept necessary restrictions. This is an important transit for anyone, but it was particularly significant for Mary with her concentration of Planets in Capricorn, because it meant that Saturn transited in opposition not only to her Sun but also to Jupiter, Saturn, Venus and Mercury, between 1856 and 1858, a very tough time for Mary when perhaps too many and too heavy adult responsibilities were thrust on her young shoulders. Below are the slow-moving Planets’ Transits of 1858 (from Jupiter outward) plotted around Mary’s Birth Chart. Looking at her life from another angle, between 1857 and 1858 Jupiter transited the Earth Sign of Taurus, forming positive aspects to all her planets in Capricorn, showing that this was also a time for expansion and improvement in her life, when her horizon widened and she became more confident. At the same time Uranus was also in Taurus, also forming a harmonious aspect to her natal Sun, fostering changes of attitude, greater personal freedom and the opportunity to become more independent. The transiting Uranus was in fact in positive aspect to the transiting Saturn, helping the expression of Saturn, making it less humdrum and more appealing to her sense of independence and her revolutionary thinking. To complete the picture, Neptune became conjunct the natal Uranus, marking, again, a time for the unfoldment of destiny in Mary’s Life, when she felt her calling and may have had profound religious and psychic experiences. Neptune was in fact moistening the budding Uranus’ genius with a strong flow of imagination, dreams and longing. This is a great transit to get inspired (Neptune) to follow one’s own unique path (Uranus in the Third House of Teaching and Learning). it will prove particularly irresistible for someone endowed with mystical sensibility. Mary, despite being inspired at an early age to a life of teaching had to wait until 1866 to fully dedicate herself to her goal, when she embraced the religious life and her mission. Her family (parents and seven brothers and sisters) stood in need of her financial support for many years and she could not forget her duty to them (Saturn’s Karma, social as well as self-imposed limitations). So what happened in between these important dates and what in 1866 changed in the sky to reflect such a transformation in Mary’s own life? If interested look up my next post on Mary, our Australian Saint. It seems now certain that Pope Benedict XVI will announce the historical beatification of Mary MacKillop tonight, 10 pm Australian Eastern Summer Time. This intelligent teacher and nun, coming from a poor family of Scottish immigrants, will be the first person born on Australia soil to be recognized as a Saint and miracle maker, an important archetypal event, significant for all Australians, not just Australian Catholics. Mary MacKillop’s was born on the 15th of January 1842 in Fitzroy, state of Victoria, Australia. Her time of birth is unknown, that’s why I have chosen to use the sunrise time for the day and place of her birth. It is very interesting to cast a chart of sunrise even when the time of birth of an individual is known because sunrise contains, in germ form, the destiny of every individual born on that day. I have often derived much insight from the study of these sunrise horoscopes. To me they stand for those aspects of the individual’s life that connect it to the collective design of the Spirit; each degree of the Sun’s passage through the Ecliptic representing a ray of consciousness that will manifest, with different measure of brightness, in all individuals who begin their life journey on a particular day. In this chart the Sun is in Capricorn and the Moon in Aquarius. It is however important to notice here that at 8.51 am the Moon entered the Sign of Pisces that day. Both Signs, Aquarius and Pisces can manifest in a personality given to feel for other people and naturally inclined to help. The fame of her compassion and claim to saintliness may suggest a Pisces Moon, compassionate, self-defacing and self-sacrificing; her chronic ill-health and love of animals could imply the same. While the fact that she contributed to the education of a great number of disadvantaged children by founding many schools in Australia rural communities and other countries would fit well the democratic vision and love of knowledge of an Aquarius Moon. Also her unconventional outlook and somewhat rebellious spirit that gained her the disapproval of the Catholic hierarchy of her time (she was excommunicated for a number of months in 1871) fits well the rebelliousness and independence of an Aquarius Moon. I am quite happy then, without going to the trouble of rectifying her chart, to consider hers a cusp Aquarius-Pisces Moon. The first obvious thing in this horoscope is the stellium (group of planets) in Capricorn, enhancing the practicality and hard-working tendencies of this remarkable woman, who displayed certainly strong leadership and organizing abilities, despite her humbleness. All Cardinal Signs (Aries, Cancer, Libra, Capricorn) tend to display those qualities, each in its own special way; when it comes to Capricorn it is their ability to perform hard work and their ambitious goals that gain them respect and following. Capricorn and Cancer in particular often make excellent role models. The fact that so many planets, Mercury, Venus, Jupiter, Saturn, plus the Sun and North Node of the Moon, are all found in Capricorn shows a tremendous ability to focus, concentrating the practical and goal oriented qualities of Capricorn in a very effective, even extreme way. This tendency toward extremism, even fanaticism, is indicated by the challenging right angle of some her Capricorn planets to Pluto, that, in the Sunrise horoscope resides in the ancestral sector, inclining her to break radically from the past. On the positive side this aspect indicated the deep wealth of resourcefulness she displayed and the strong will and determination that helped her to achieve some very ambitious goals, for a woman in that period in history, and a socially and economically disadvantaged one to boot.To confirm this Uranus was also in positive aspect to her Sun and Mercury, another proof of her unconventional outlook and strong individuality. In the Sunrise Chart this rich conjunction is found in the Twelfth House, an appropriate position for a woman who decided very early in life to renounce the mundane world and to dedicate herself to God’s work. The twelfth sector of any horoscope in fact represents the area of experience through which, willing or not, we realize the futility of our ego desire and the impermanence of things, experiences that sometimes drive us to seek refuge in the spiritual dimension or in some form of escapism. Another very interesting configuration in this Chart is the close conjunction of Jupiter to Saturn, often found in the horoscopes of people who succeed to make their dreams and aspirations (Jupiter) into living realities (Saturn), because they are driven by a vision and compelled to actualize it. This conjunction may also point out Mary’s love and respect for her father (the one who took care of her education and religious instruction when she was growing up and supposedly inspired her to take up teaching) and perhaps to an excessive idealization of the man, and of older men in general. From her biography we learn how one reason why she decided to embrace the life of the cloister and her mission with the poor was her encounter with another father figure, Reverend Julian Tenison Woods, who became her instructor and mentor in the formative years before her Saturn’s return, at the age of thirty (around the time she was excommunicated by a Catholic bishop, for alleged insubordination). Another interesting placement is that of the planet Neptune in Aquarius and in the Second House, the sector that has to do with our value system and also the way we are likely to derive an income. Neptune, planet of spirituality and renunciation, sits just on the cusp (the most sensitive point of every House) of Mary’s Values’ sector. This shows that the things she valued weren’t material possessions but belonged to the world of the Spirit. The best expression of this position of Neptune is a person born to give and ready to transmute the ego desires into selfless giving. The worst expression of the same is the tendency to be unrealistic and unpractical when it comes to money and possessions or even to rely on others for one’s own sustenance. By embracing the life of a nun Mary has manifested this aspect in an ideal way, by taking a vow of poverty and using her resources to help others in need, in particular the underdogs of the society she lived in. To end this brief analysis of Mary MacKillop’s planetary positions I cannot overlook the role of Chiron in late Cancer, the only planet on the opposite hemisphere to the multiple conjunction in Capricorn. Chiron is in fact in opposition to her Sun and Mercury and perfectly conjunct the South Node of the Moon. This peculiar position helps this little planet acquire a greater importance in the interpretation of this Horoscope that it would otherwise have. Looking at this Chart like one looks at a painting Chiron is like a splash of contrasting colour or a feature in an art work that continually shifts our visual attention from the main theme on the other side of the canvas. Chiron in Cancer often shows a degree of frustration and a need for resignation in the area of nurturing. I found it sometimes in the Birth Charts of individuals, in particular women, who have suffered greatly through the inability of producing children or of properly nurturing or enjoying them. Like with all other Chiron’s position this is really an opportunity to utilize the apparent difficulty in order to gain greater awareness. Certainly Mary was able to sublimate her frustrated maternal instincts and inability to have children, due to her religious vow of chastity, in working all her life with children and for children. The conjunction Chiron-South Node of the Moon further exemplifies that her experience of chronic illness was a physical, perhaps hysterical expression of this inner conflict. The South Node always points out something that we need to relinquish, an experience or dimension of life that is part of the past, helping, at the unconscious level, to build the future (North Node), while, at the same time, in need to be forsaken in this life-time. In the Sunrise Chart Chiron and the South Node are also found in the Relationship sector Seventh House), showing that close, one to one relationships have somehow to be renounced for the greater good, her work and the driven, all devouring ambition symbolized by the multiple conjunction in ambitious and workaholic Capricorn. Finally the Chiron’s effect seems even more significant in the light of the miraculous cures that have been attributed to the intercession of Mary MacKillop, in life as well after her death, and that are the basis of her beatification. We cannot forget that Chiron is the wounded healer of archetypal legends, able to heal others while unable to offer a cure to himself, because the experience of suffering was central to his character and destiny. Vega, the alpha star of Lyra, the Harp constellation, is conjunct Mary’s Venus, while Altair, the alpha star of Aquila, the Eagle, is conjunct her Mercury. Vega is traditionally said to add a strong charisma to the personality and conjunct Venus, the planet of femininity, gave Mary the power to attract that made her bossy temperament more fascinating and subtle. This is the instrument of Orpheus, the enchanter who was able to bridge the gap between the realms of life and death through the magic of his music. People influenced by Vega can be very persuasive and attract following. Altair, on the other hand, is also a fortunate star, indicating the strength and courage to pursue one’s goals in life, and certainly Mary had plenty of that too. Because it is Mercury that is in contact to this powerful star the Eagle’s qualities would have influenced in particular her intellect and communication skills. According to Bernadette Brady through this star we are able to act quickly and decisively, seizing the moment, while its darker side can be aggression and forcefulness. With the Moon conjunct Mars, even from the delicate and non aggressive Sign of Pisces, Mary was a born militant, ready to fight for what she believed was right and God’s will. Mars in Pisces embodies remarkably well her power to act and be assertive when motivated by compassion and concern for human welfare and spirituality. 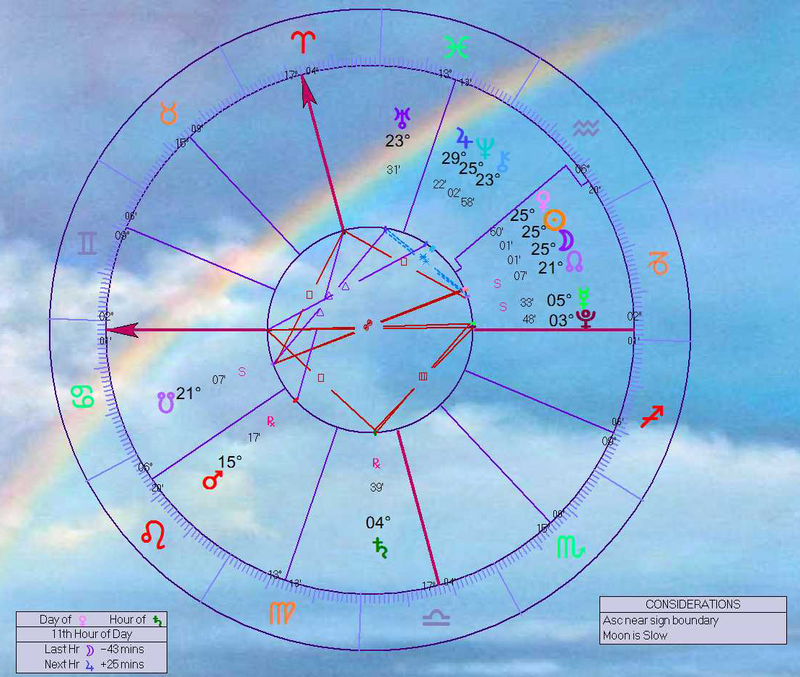 The Capricorn New Moon just prior to her birth (on January 12) coincided with a Solar Eclipse. During this eclipse the multiple conjunction in Capricorn had its heyday, enhancing the destiny making qualities of this rare configuration. A look at this Eclipse will make this more clear. As you can see the Solar Fire program, used to generate this Chart, makes the glyphs of the celestial bodies forming the mighty Capricorn conjunction to overlap one onto the other, in order to fit them all in such a limited area of the Zodiac. Even if some will doubt the veracity of her miracles no one would deny that this humble and socially disadvantaged woman was an amazing miracle worker and accomplished incredible feats of compassion that still live in her name today. 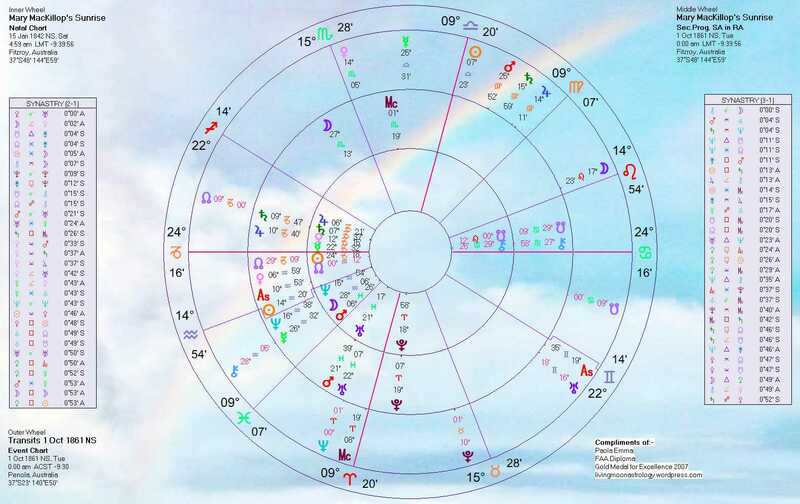 I have a lot more to say about Mary MacKillop’s Chart and the Transits and Progressions that constellated the major events in her life, and those that are still activating her horoscope today. If interested, keep an eye on my next posts.